However there are some ways in which the effects of karma may be off-set or mitigated. Chiefly this is achieved through reflection, experiencing remorse, and abstaining from harmful actions in future. Although this cannot affect the consequences of actions already undertaken, it does mean that one can be free of suffering at some point if one refrains from unskilful action in the present. However a couple of texts suggest that it is possible to "dilute" the effects of karma through spiritual practice. The Lonaphala Sutta (AN 3.99) begins by pointing out that the same trifling fault may send one person to hell, and yet another may only experience a fleeting trifling pain in the here and now. Why is that? It is because the former person has made no effort to develop themselves, which the latter has. There follow three images the most interesting one involving a salt crystal. If a salt crystal is dropped into a small amount of water, that water is rendered undrinkable. 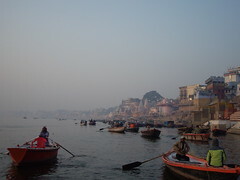 However if you drop a single salt crystal into the Ganges River it will make very little difference (presumably the Ganges was a lot cleaner in the Buddha's day because drinking it now could be fatal!). Spiritual practice in this sutta means "development of the body (kāya), virtue (sīla), the mind (citta) and understanding (pañña); and dwelling in the unrestricted, large-hearted, immeasurable [state]". The last seems to be a reference to the Brahmavihara meditations. This list is a variation on the threefold path of ethics, meditation, and wisdom; it also resembles the foundations of mindfulness (satipaṭṭhāna). Such spiritual practice makes one 'bigger' and so the effects of karma are diluted. One of my teachers has suggested that we could think of merit (puñña) in terms of emotional robustness. Through practice we become more emotionally robust, less pushed around by the vicissitudes of life. We are more able to maintain equanimity in the face of provocation. A related notion can be found in the Devadaha Sutta (MN 101) . In this sutta a man is suffering from jealousy. He is made angry by the sight of his lover laughing and joking with another man. but the sutta points out that his suffering may cease if he is able to unhook himself from the attachment to his lover. This need not mean letting go of love itself, but specifically letting go of attachment and clinging - remove the cause and the effect is removed. One can mitigate the effects of jealousy by removing the cause for the arising of a painful mental state. One sees this also in the Buddha's response to painful physical sensations - in a sutta called The Dart (SN 36.6). The Bhagavan's foot is pierced by a sliver of stone, but he does not respond with aversion to painful sensations which cannot be avoided, and so does not suffer. Morphine apparently works in this way: taking morphine does not block painful sensations from reaching the brain the way some other pain killers do, but it changes the perceptual relationship to the pain, with the result that one relaxes and is not distressed by it. Whatever developments came afterwards, the message of the Pāli Canon seems reasonably clear. Having acted one will inevitably experience the consequences of that action. However the consequences may be mitigated to some extent through spiritual practices. The basic approach is simply to reflect on previous actions and consequences so that one learns not to create more difficulties. But a benefit from doing this, and of spiritual practice generally, is that when painful consequences do happen, we are able to be more robust, more equanimous, and so we suffer less. We become like a great river that can absorb a little salt crystal without being rendered unfit to drink. However I suppose that the state of the Ganges in the present is something of a warning against complacency. Even a great river may become disastrously polluted if we are not careful. I take this to be an image for guarding the gates of the senses - just because we become more robust does not mean that we can more freely indulge our bad habits. Gombrich, Richard. Theravāda Buddhism : a Social History from Ancient Benares to Modern Colombo. 1st ed. London: Routledge, 1998. Suttas on Access to Insight. Why did Kūkai sail in Summer?